A lot of people think they only need to protect themselves from ultraviolet (UV) rays during peak hours on hot, sunny days. Winter is a great time to debunk the myths about UV. -80% of UV rays can penetrate clouds. 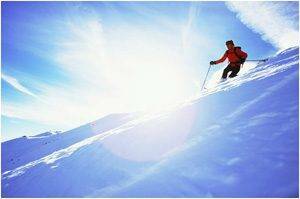 -Those who engage in winter sports may be more at risk, because they are spending time at higher elevations and getting a UV “bounce” from snow. -Maximum UV exposure is at a solar angle of 20-40 degrees, not at noon when the sun is straight up overhead. Acuvue Brand Contact Lenses add an extra layer of protection from UV-A and UV-B. Visit Dr. Graham to try on Acuvue Vita contacts, the new monthly disposable, today!